GET LIST - Get a list of all SSO integrations in your account. GET SSO - Get information about a specific SSO integration in your account. CREATE SSO - Set up SSO in your account. entity_id This is the globally-unique URL/string of your IdP entity. cert This is your certificate file (.crt) for your IdP which can be downloaded from your SSL Issuer. UPDATE SSO - Update/Change SSO integration information. DELETE SSO - Delete specific SSO integration from your account. This is the globally unique URL/string of your IdP entity. It's like a mailing address that we, the service provider, use to contact your IdP. 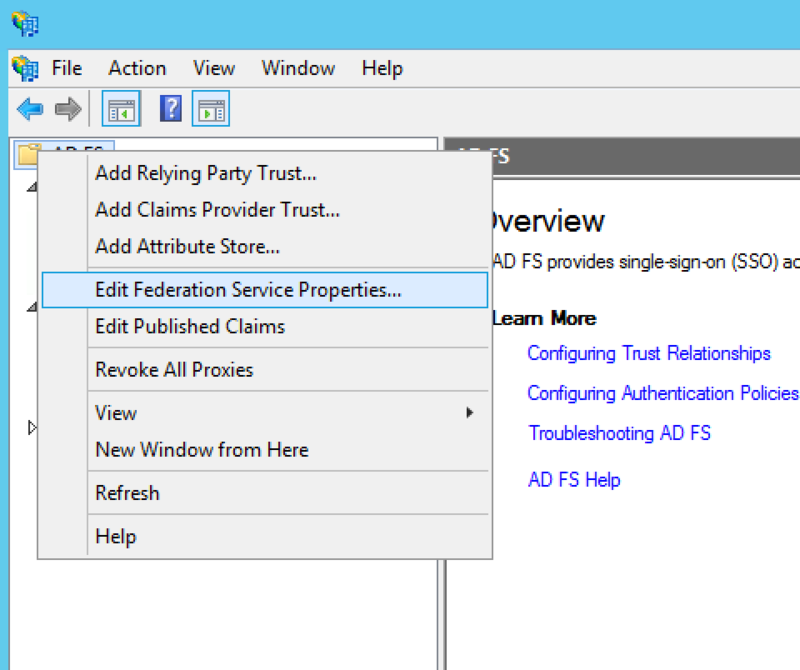 Your Entity ID can be found in your AD FS Management Console by right-clicking the AD FS Folder and selecting Edit Federation Service Properties. 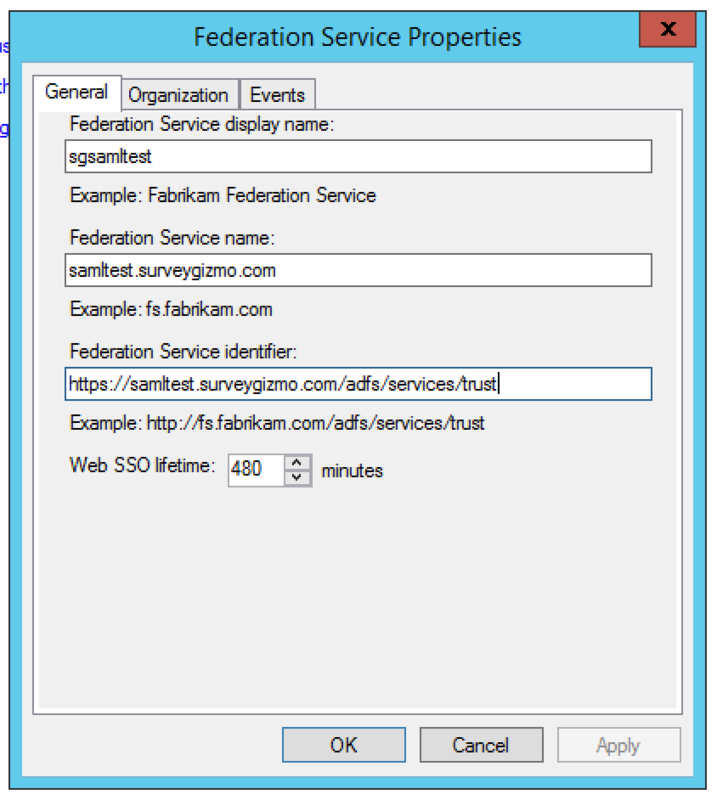 The URL in the Federation Service identifier field. The source of truth for usernames and passwords. This is the URL for logging in to your IdP. The Login URL is often very similar to the Entity ID URL. This is where we will send the SAML request. Unique string to identify users. When sending Name ID to SurveyGizmo we recommend it be their email address. The web-based application/s that are accessed via the IdP. an XML standard that allows secure web domains to exchange user authentication and authorization data. Using SAML, an online service provider can contact a separate online identity provider to authenticate users who are trying to access secure content. Provides partner companies with full control over the authorization and authentication of hosted user accounts that can access web-based applications. This is your certificate file (.crt) for your IdP which can be downloaded from your SSL Issuer. NOTE: If the file you have also has the ‘intermediate’ or ‘root’ certificate chains in them, that’s fine, as long as it has the main certificate for the domain included. The Name of the system user in email address format.